We are now in the construction phase of our New Westminster Secondary School Replacement Project – a $106.5 million, state-of-the-art new home for one of British Columbia’s largest high schools! 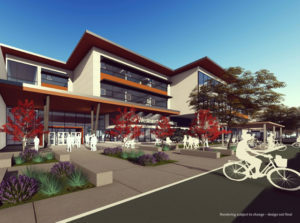 Scheduled to open in September 2020, our future New Westminster Secondary School will accommodate 1,900 grade 9 to 12 students in a 21st century learning environment.that meets today’s standards for modern learning, safety and accessibility, while incorporating the latest sustainable energy management systems. If you would like to be added to our notification email list to receive construction and project updates, please provide your email here. New Westminster Schools and the Ministry of Education selected Graham Design-Builders with KMBR Architects Planners Inc. to design and build the new school. Please note the construction notices below. 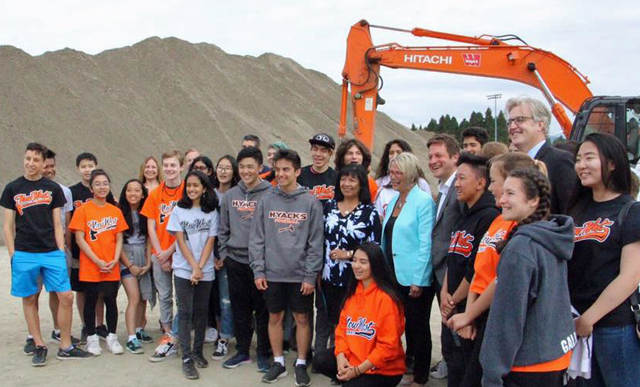 The evidence is in and it’s unmistakable: one of the largest and most up-to-date learning environments in the province is rising up and out of the ground as the seismic replacement for New Westminster Secondary School becomes reality. With a 429-day countdown to completion as of yesterday, the two-block worksite is a hive of activity. This week, some 20 truckloads carrying a total of 182 cubic metres of concrete will be delivered to the site; the material is being poured (using a ‘slab-on-grade’ approach) for the school’s huge gym floor – which is the size of three side-by-side gymnasiums. 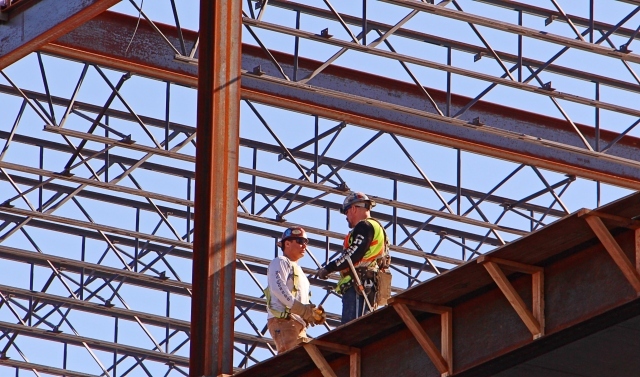 Over on the east wing, roof trusses and cross-bracing are appearing above the three-storey school’s top floor – a design factor in the $106.5 million new school’s earthquake resistance capabilities. As of November 16, 2018, it was 552 days to the finish line in completing a replacement for New Westminster Secondary School. “We’re on budget and on schedule,” said Grant Lachmuth, Chief Project Officer for the New Westminster Secondary School Replacement Project…See more. reduction of parking spaces on 6th Street in the adjacent work area (15 parking stalls in the east side; 8 parking stalls in the west side). 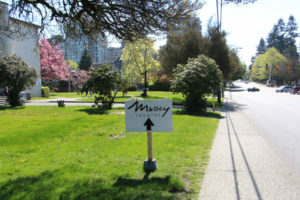 Excavation and installation of new underground sewer, water and sanitary lines is proceeding in a westerly direction along the school construction site and as of July 23, will begin in a southerly direction between the Moody Park Arena and Massey Theatre toward Eight Avenue. This will lead to reduced access through the laneway between the Moody Park Arena and the Massey Theatre starting Monday and continuing through August. Traffic management plans will accommodate ongoing access. 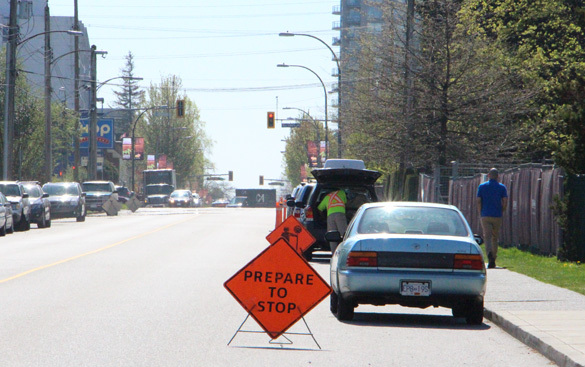 In order to avoid unexpected delay, the public is encouraged to access parking and to conduct drop-off and pick-up activity using laneway access from 10th Avenue. Bulk excavation continues through August as organic materials are removed from the 10,000 square-metre site in preparation for the ‘detail excavation’ phase, which will confirm the accurate ground-point for the foundation of the school. Auger drilling is proceeding. Minimal noise is associated with this activity. A drilling rig using hydraulic equipment will spiral 220 augers into the ground to varying depths, a process that will underpin the foundation of the new school. This work will also continue through August. Excavation and installation of new underground sewer, water and sanitary site services will continue through the month of July, with the work extending now from Sixth Street to the building site. Impact on traffic is minimal. A traffic management plan is in place and consists of flagging on Sixth Street as trucks turn left only upon leaving the site. The sidewalk is partially closed. Bulk excavation also continues through the next three weeks of July as organic materials are removed from the 10,000 square-metre site in preparation for the ‘detail excavation’ phase, which will confirm the accurate ground-point for the foundation of the school. The demolition of the skateboard park is now complete, and was finalized mid-last week. Auger-pile drilling is proceeding. Minimal noise is associated with this activity. A drilling rig using hydraulic equipment is spiraling 220 auger-piles into the ground to varying depths, a process that will underpin the foundation of the new school. This work will also continue through the month of July. Underground civil works on Sixth Street have progressed well and are ahead of schedule. As a result, Sixth Street will be fully open to traffic, with an end to partial road closures in the coming week. A drilling rig is now situated on site in preparation for the installation of a series of 220 auger-piles that will be spiraled into the ground to varying depths, a process that will underpin the foundation of the new school. This work involves the use of hydraulic equipment. The activity is scheduled to begin June 21 and will run for several weeks. Expect minor noise. Also scheduled to begin June 21 is the tentative removal of half a dozen trees in accordance with the City of New Westminster’s tree protection protocols. 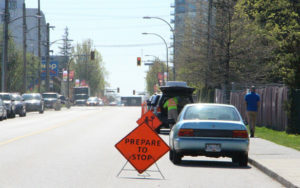 The New Westminster Schools Replacement Project team thanks residents and visitors for their patience as Graham Construction continues with civil works starting at Sixth Street and requiring trucks to turn left only upon leaving the site. The process of installing a new line of underground services for storm water, sanitary and water main lines will continue to require occasional single lane traffic over the next two to three weeks. Residents can also expect partial closures of the west sidewalk at Sixth Street. The work procedure involves excavating trenches, installing new pipes and restoring the sidewalk, backfill, and asphalt. 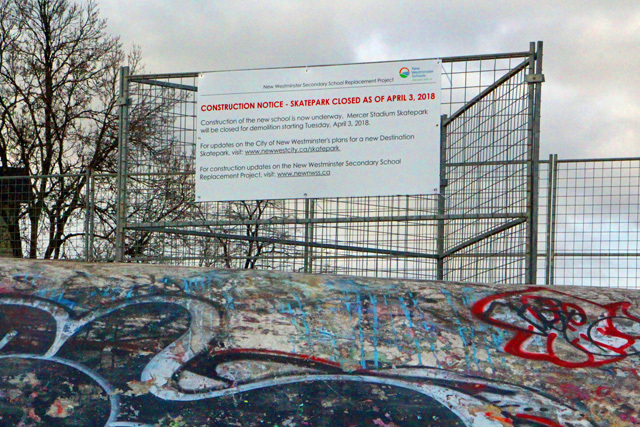 Mechanical demolition of the skateboard park is scheduled to begin June 14 and is expected to last seven working days. The demolition will entail moderate noise associated with the use of a concrete saw. Ongoing activities continuing over the 18,000-square-metre construction site include removal of organic materials and detail excavation to level the site in preparation for the new school. Preparation for the installation of steel anchor posts is expected to begin June 18; the posts will ensure the new school meets seismic regulations. 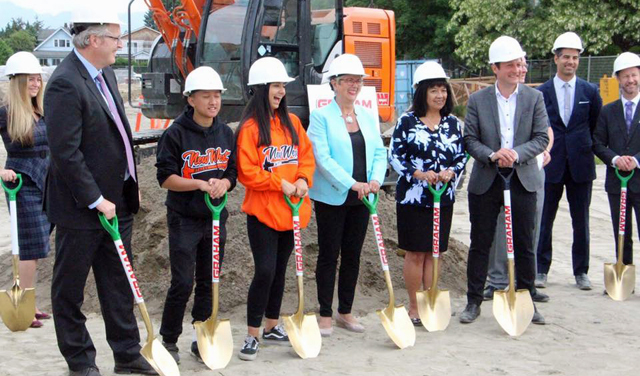 An official groundbreaking ceremony was held on site May 25 that included the Minister of Education Rob Fleming, as well as grade 9 student representatives who will be among the first to graduate from the new high school after it is completed in September 2020. The related New Westminster Record story is here: https://bit.ly/2KWGKzs. As part of the New Westminster Secondary School Replacement Project, the contractor Graham Design Builders LP will be installing a new line of underground services (new storm water, sanitary, and water main lines) starting Monday, May 28th, 2018. The installation will start at the 6th Street entrance to the construction site and cross the construction site area to connect to the existing lines in the Massey Theatre driveway. Monday to Friday from 7:00 a.m. to 5 p.m.
6 weeks will take place inside the construction site area with no road or sidewalk closure. During any deconstruction, it is common practice to identify the conditions of the materials for disposal. The contractor at the replacement project site embarked on testing of the surface materials as well as the concrete itself prior to demolition of the Mercer Stadium skatepark. 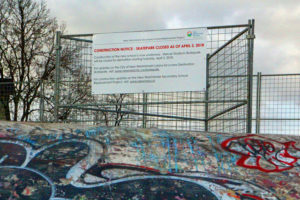 Preliminary testing four to five days ago confirmed there is no asbestos in the concrete but indicated trace amounts of lead associated with some of the sub-surface layers of graffiti paint on the site, prompting further tests. As a result of the findings, the contractor is following safety and government procedures in proceeding with the demolition of the site, as prescribed by WorkSafe BC and government environmental and hazardous waste regulations. The mechanical demolition is now scheduled to begin May 16 and continue through to May 29, 2018. In other activity, foundation work will begin with the removal of organic materials from the site starting May 14, and continuing over a period of several weeks. As a result of revised priorities, the date for the mechanical demolition of the Mercer Park skateboard park has been moved to May 7. In moving forward with site excavation, traffic management plans are now in place. Local drivers are seeing construction notices and flagging on Sixth Street controlling exits around the site as trucks turning right only leave the site. Expect some minor delays as measures ensure vehicle traffic can safely exit the site. In addition, signage is in place on Eighth Street and Eighth Avenue clarifying parking arrangements for patrons of Massey Theatre. Patrons with mobility issues are directed to clearly designated stalls behind the Massey Theatre; the general public is directed to appropriate parking stalls in the New Westminster Secondary School parking lot to the North. Eight days are scheduled for the mechanical demolition of the Mercer Stadium Skatepark starting April 25 following a weather-related delay last week. Moderate noise will be associated with the use of a concrete saw. For updates on the City of New Westminster’s plans for a new Destination Skatepark, click here. Also on April 25, site establishment work involving shallow excavation will begin, weather permitting. The weather is always a factor in construction projects – and the week from April 8 to 12 saw a delay in the process of site stripping and shallow excavation due to heavy rains and site saturation. However, site establishment work is scheduled to continue through the month of April. At this stage, the delivery and set-up of construction trailers has been completed. In the coming week – weather permitting – the demolition of the Mercer Stadium skatepark will begin and is expected to continue through to April 20. Construction of the new school is now underway. Mercer Stadium Skatepark will be closed for demolition starting Tuesday, April 3, 2018. For updates on the City of New Westminster’s plans for a new Destination Skatepark, click here. This phase of construction will include site condition preparations, protection of trees on the site perimeter, and removal of the upper layer of top soil (‘site stripping’) prior to work. Trailers for first-aid, storage and office support will be set up between April 9 to 17. Impacts at this time will include moderate noise associated with mechanical demolition of the skatepark between April 3 and April 13, as well as low noise from excavation activities associated with site preparation work. Minor traffic disruption, mainly in the laneway, can be expected between April 9 to 17 in relation to trailer set-up. Please note that the Massey Theatre is expected to remain fully operational throughout the construction phase of the New Westminster Secondary School Replacement project.